There’s nothing I like more than to spend time strolling around Birmingham City Centre on a bright sunny Autumn day! Autumn is my favourite season of the year, followed closely by Christmas and there are always lots of great beauty trends and releases to keep up with. 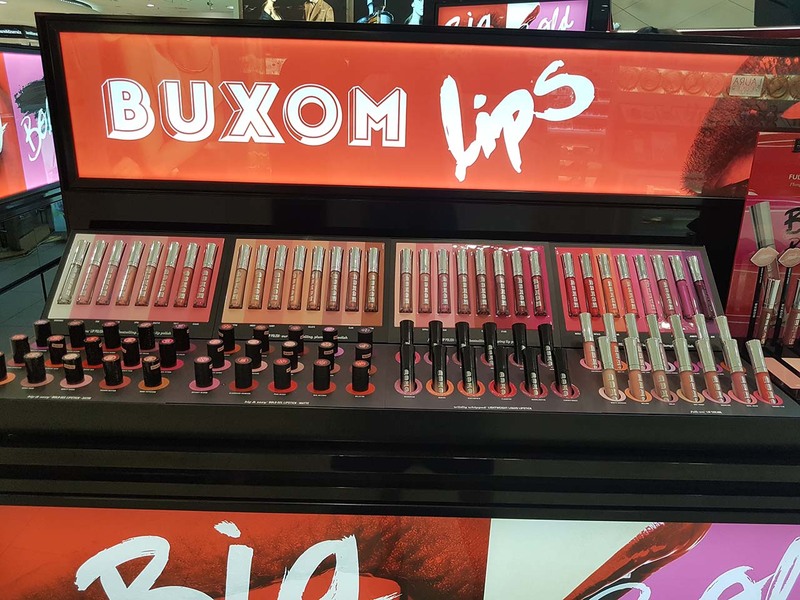 Recently, I spent a day wandering round the department stores to see what brands had newly released and whether any new brands had arrived in Birmingham. There was a lot to check out, so I thought I’d share my day with all of you in 2 parts! Read on for part 1 of my beauty day! 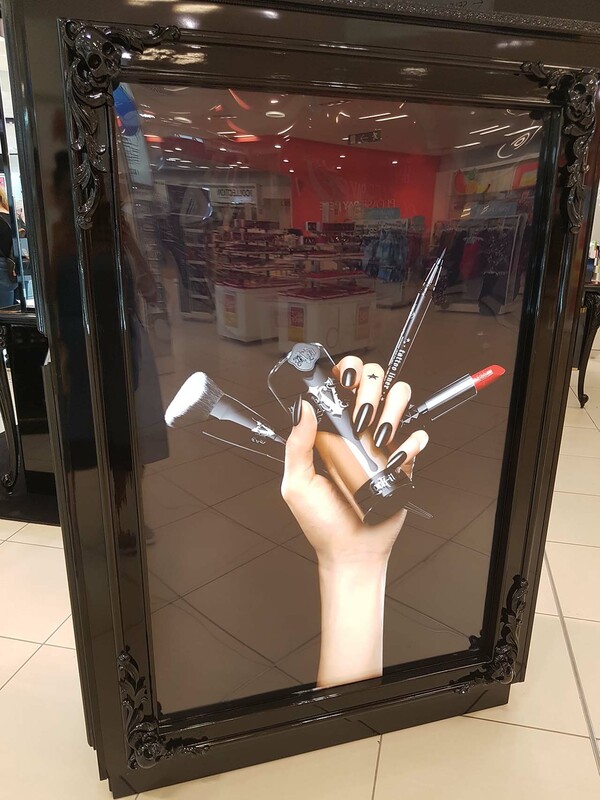 Debenhams has come a long way since I first started shopping there! 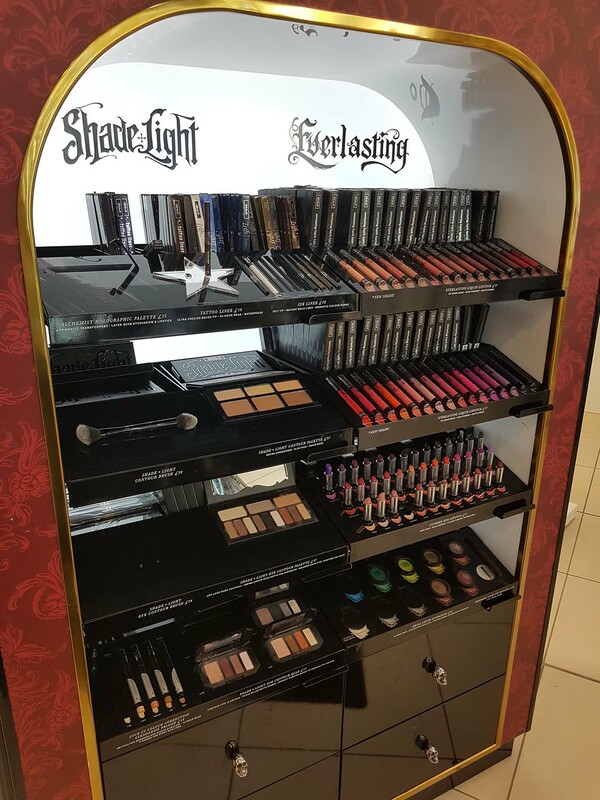 They now stock a lot of quality beauty brands and they offer a Beauty points card which is great for someone obsessed with makeup! 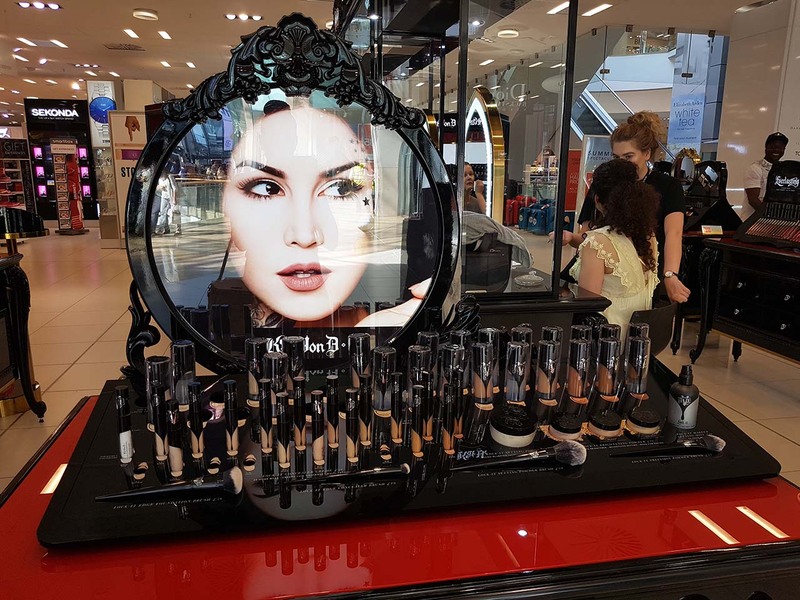 Over time, they have added more brands to their beauty and cosmetics floor such as Nyx and Too Faced most recently and they also brought in a Benefit Brow Bar! I now visit the brow bar every month and wouldn’t dream of going anywhere else! 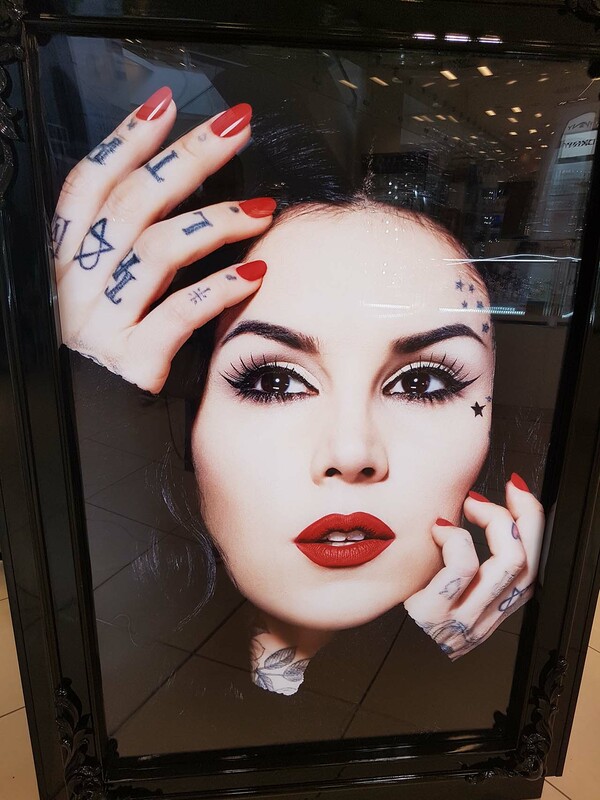 Since I took these photos, Kat Von D has released further amazing products, such as her Glimmer Veil Lipsticks, the Shade and Light Glimmer Eye Palette and her massive Everlasting Lipliner range. She also released the Saint and Sinner palette! I have bought all of these items and will be reviewing them in the future so watch out for them! 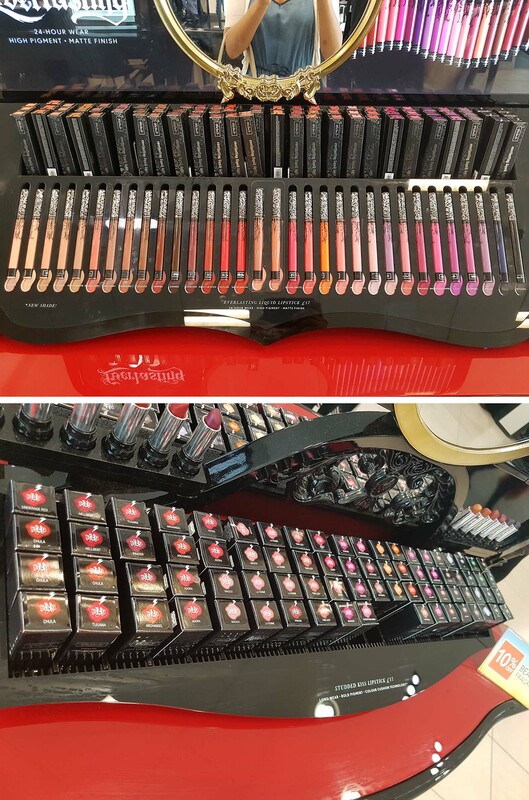 What I can say now is that everything she produces is excellent quality, long lasting and highly pigmented so if you have never tried her makeup, you really should. 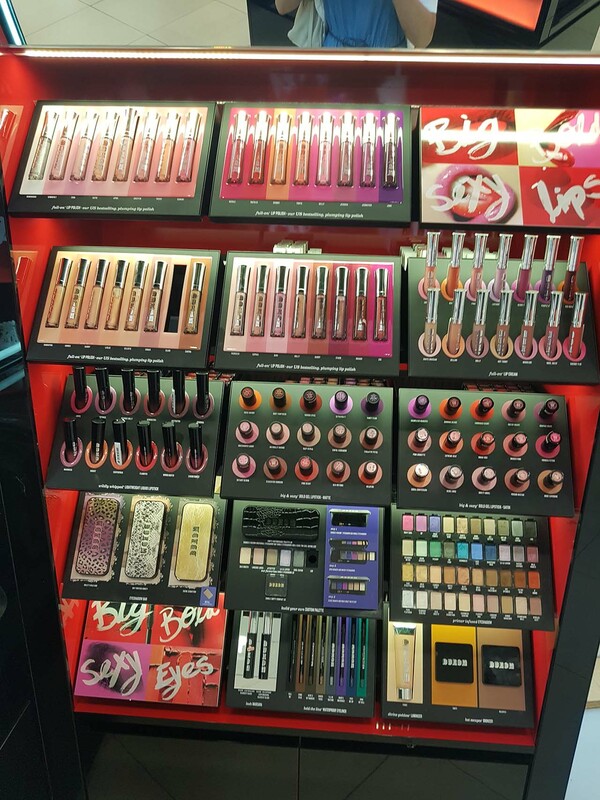 After having a look at everything, I decided to test the Full On Lip Polish in store, as it claims to plump the lips! I am not particularly concerned about making my lips look bigger as I have full lips anyway but wanted to see if it made a noticeable difference. I have to say after application it does give the illusion of full juicy lips! It also has a peppermint taste and scent and makes your lips tingle pleasantly for hours. I bought the shade Clair and love to use it over matte lipsticks! 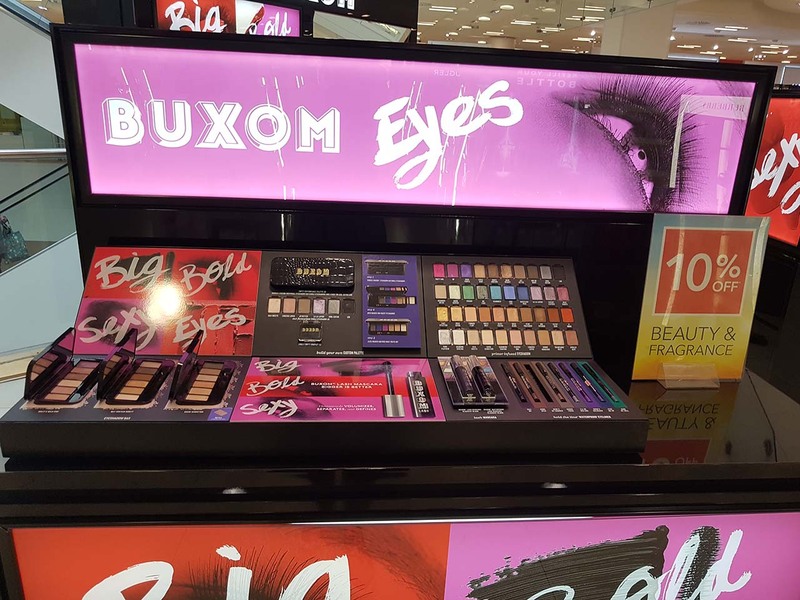 I also tested the Buxom eye-shadows and found them to be very good quality too but I refrained from buying any as my eye-shadow collection is already extensive! This brand has been at Debenhams for some time and is an all-time favourite for me. 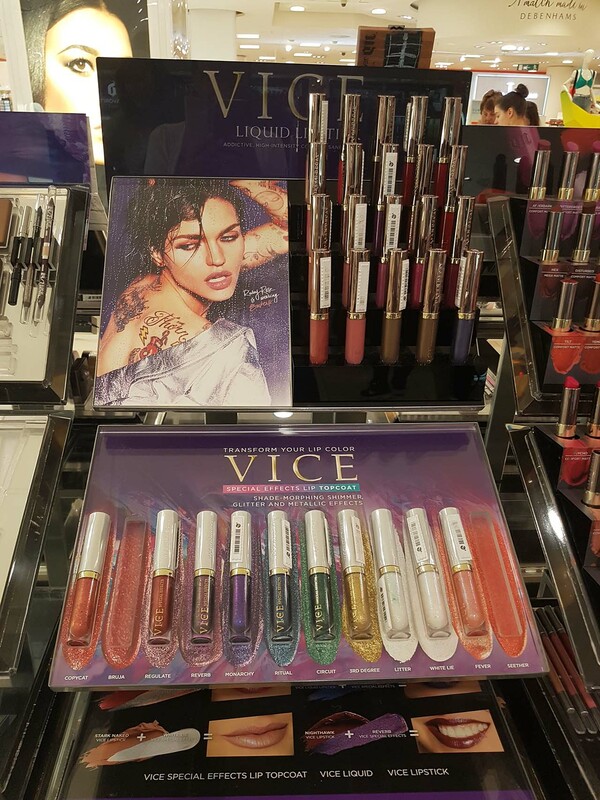 On this particular day, they had not long released the Vice Special Effects Lip Top Coat collection, which I was very excited about! Lip top coats and lip toppers are a big trend for 2017 and I have bought several from different brands. The Urban Decay version is very good and so far, I have 3 of them! If you have never tried this type of product, check out my review of some of my favourites here. 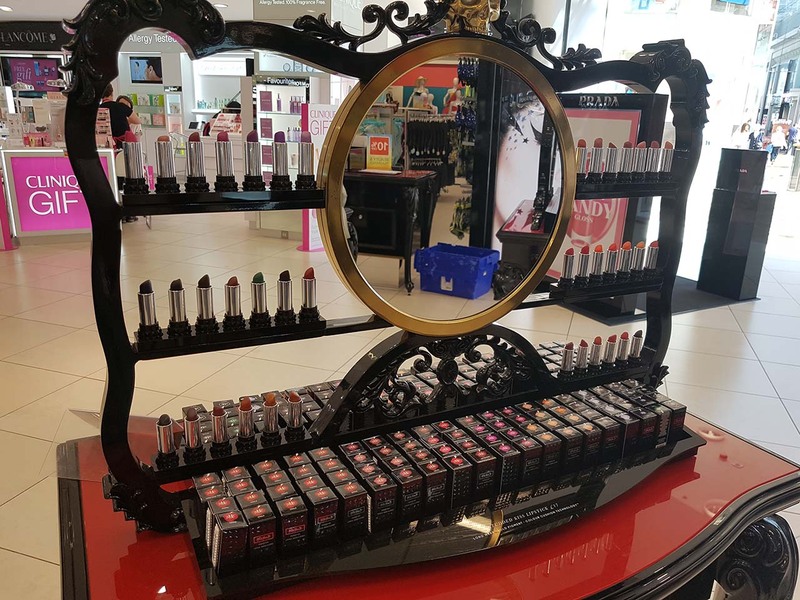 Since this visit, Urban Decay have brought out further new items which will be hitting Debenhams shortly, you can check out the new releases here! I have already bought 2 of the new Heavy Metal Glitter Eyeliners and I’m loving them! I actually swatched these items and you can see how pigmented they are! I didn’t buy anything that day but have since bought the eyeshadows and they are gorgeous, on their own or over the top of other shades. Illamasqua also produce stunning Highlighters of which I have 4 and innovative Primers of which I have 2! They have recently created a new Primer called Beyond Veil which I am definitely going to check out! This new system allows you to create your own custom palette using the blush, contour and highlighting pans. You can also create your own eyeshadow palettes! I did not create any palettes for myself on this occasion but already know which shades I will select when I do! Makeup Forever also produce excellent Foundations of which I have one and it is the closest to my natural skin tone I have found anywhere! After finishing my stroll around Debenhams, I took a trip to Selfridges! To find out what I discovered there, read part 2 of my Autumn Beauty Day next week!